You may not think of it as the most exciting car in the world, but the newly redesigned Volkswagen Golf compact car has been named Motor Trend magazine's Car of the Year. The award is for all four available versions of the Golf. That includes the sporty Golf GTI, the diesel-powered Golf TDI, the electric-powered e-Golf and the basic Golf 1.8T. This seventh-generation version of the compact car is lighter and more fuel-efficient but still larger than previous Volkswagen (VLKAF) Golfs. The Golf is like a small, inexpensive luxury car, Motor Trend editor-in-chief Ed Loh said. It is fun to drive but quiet with a smooth ride. Also, the body had the "some of the sharpest sheet metal creases in the industry and some insanely tight panel gaps," he said. Volkswagen's engineering prowess is also displayed in the Golf's wide array of available engine and transmission options. Besides those already on the market here, the 292-horsepower, all-wheel-drive Golf R and the Golf SportWagen models will be available early next year, the magazine said. "The Golf is studied by all the auto industry," Loh said. "It's a model of packaging efficiency." 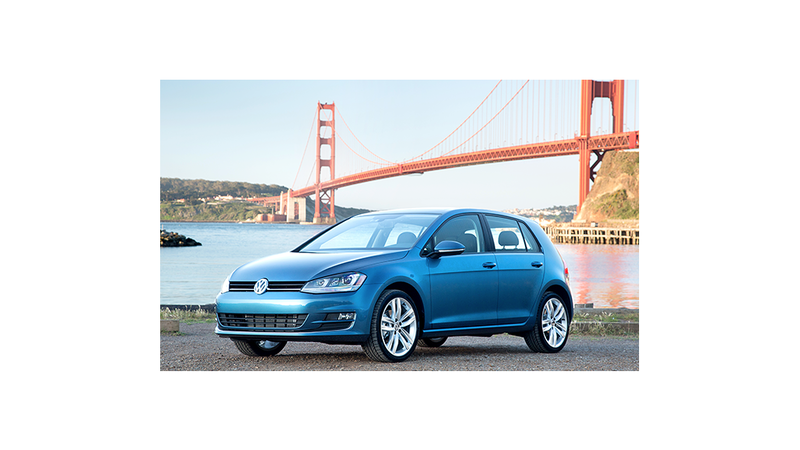 Motor Trend also credited the new Golf for its interior and exterior styling and refinement and broad array of available equipment in even the cheapest versions. Prices for the Golf start at about $18,000. To capture the top prize, the Golf beat out 23 other completely new or substantially redesigned models considered by the magazine. After testing the cars at the Hyundai proving grounds in the southwest California desert, the magazine's staffers narrowed the list to 10 finalists. The other finalists were the Audi A3, BMW 2-series, Ford Mustang, Honda Fit, Hyundai Genesis, Kia Sedona, Lexus RC, Maserati Ghibli and Mercedes-Benz C-class. Those cars were then tested on roads and highways around the town of Tehachapi, Calif. After further debate, the writers and editors selected the winner by secret ballot. Rather than comparing cars directly against one another, which would unfairly pit cars of different types and prices against each other, each car was judged independently according to six criteria: design, engineering, efficiency, safety, value, and performance of intended function.